A massive fire broke out at Paris’ Cathedral of Notre-Dame Monday evening, toppling the medieval structure’s spire and collapsing its roof. 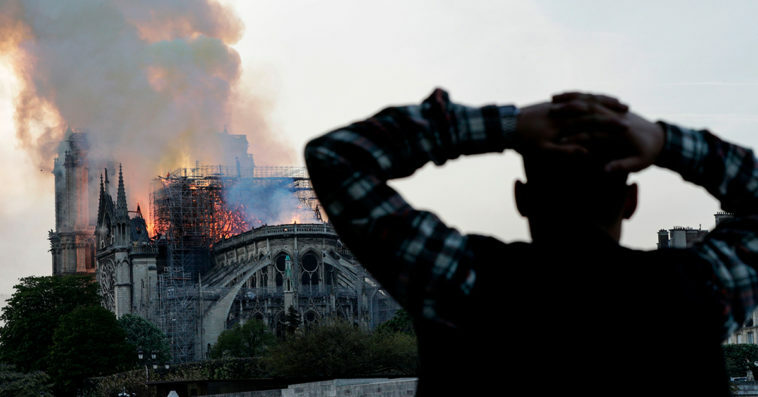 Cathedral spokesperson André Finot told the New York Times in a phone interview that the cause of the fire is still unknown. There have been no confirmed deaths or injuries reported at the time of writing. Though Paris Mayor Anne Hildago and firefighters warned people to stay away from the area, hundreds of Parisians and tourists captured photos and videos of the devastating fire engulfing the cathedral. Firefighters on cherry picker cranes sprayed water in an attempt to douse the flames. Located in Île de la Cité, a small island in the middle of the city, Notre-Dame draws an estimated 13 million visitors annually. The cathedral was in the midst of renovations with large swaths of it under scaffolding when the fire broke out. The fire continued to rapidly spread as onlookers captured the destruction on their phones, even as soot and ash rained down onto them. The cathedral dates back to the 12th century and enjoyed a resurgence in popularity soon after the publication of Victor Hugo’s seminal novel, The Hunchback of Notre Dame in 1831.